We had hoped that our Medinilla scortechinii 'Orange' would be well received at the 2008 Tropical Plant Industry Exhibition, but we were delightfully surprised when it was awarded 'Favorite New Flowering Plant of 2008'. People were immediately attracted by the intense color and profuse blooms exhibited by this Medinilla. The bright orange stalks and panicles of the flowers looked like an exotic tropical coral. We thought our Volcano plants would be the "hot" item at our booth, but the 'Orange' was even hotter. We received inquiries from all sorts of people... growers, brokers, landscapers, retailers. It was just phenomenal. This is one of our favorite plants and it was really exiting for us to see how warmly it was received. A lot of our success at the tradeshow is probably tied to the number of people who came in to learn more about this beautiful plant. 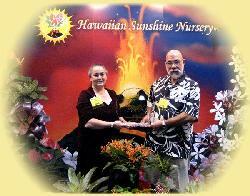 Use http://hawaiiansunshinenursery.com/cgi-bin/hsn?A-DKTP7JC-CFBY-D to EMail this article to friends.